What if taking your kids to your Hoover, AL, dentist could actually be fun? Believe it or not, that’s not as far-fetched as it may sound. 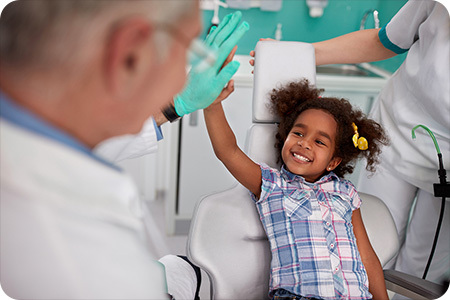 Here are a few ways you can get your child excited for their dental check-ups. Kids aren’t always comfortable going into new environments, but introducing them to the dental team early on can produce an entirely different experience. The American Dental Association and our Hoover, AL, dentist recommend that children should have their first dental visit no later than six months after their first tooth appears or around their first birthday, whichever comes first. Kids love going to the playground or the ice cream parlor because they know something super fun awaits them. That same logic is why so many pediatricians stock lollipops to hand out after immunizations. It’s great if you can take your child to a dentist in Hoover, AL, where you can help promote a positive association by linking dental checkups with something fun like a new coloring book to use in the waiting room or a YouTube playlist that kids can watch during their cleaning. A lot of tantrums can be linked to children feeling like they’ve lost control. From fighting for the right to wear shorts in December to refusing to eat anything green, kids want to have a say, so give it to them! Use a calendar and some smiling tooth stickers (easy to find at craft stores or online) to track good hygiene habits and then create a “report card” your child can take back to their Hoover, AL, dental office. Remember, pride can be a powerful motivator, and who doesn’t want to show off a perfect teeth-cleaning streak? Sometimes, to prepare a child for his or her first dental visit, parents may say something like, “Don’t worry, you’ll like it!” or “It won’t hurt!” Even though we say such things with the best intentions, statements like these can backfire. Think of it this way: when you bring your child to get ice cream, you don’t say, “It won’t be scary!” We typically don’t make statements like this when there’s truly nothing to worry about. When you do end up saying “Don’t worry,” therefore, your child can hear the undertone of negativity and might end up worrying BECAUSE of your assurances. To avoid this, say fully positive statements such as “The dentist’s office is so much fun!” Talk about exciting things your child can watch for, like the dentist chair that moves up and down like a ride or the fun flavored toothpaste used during your child’s dental cleaning. Our Hoover, AL, Dentist Reminds Parents to Have Fun, Too! Above all, remember that your child gets his or her cues from you. If you’re anxious about how a dental appointment is going to go, your child might reflect that anxiety. Get excited about your kids’ dental health and those good habits are likely to catch on, too.